Binomial name Cinnamomum tamala. Tejpat [Indian bayleaf] grows in tropical and subtropical areas of the Himalayas at altitudes of 300 and 2400 meters and comes originally from Nepal, Bhutan, Sikkim and North India. Tejpat [aka bayleaf in Europe and tejpatta in India] is a one of the key ingredients to make Indian style garam masala in Nepali kitchen. Tejpat is used to cook Khasiko masu [Mutton stew], pulau [a famous rice dish cooked with nuts and herbs] and Indian style tea etc. The basic purpose of tejpat in Nepali cooking is also to balance the overpowering flavor and taste of any meat or vegetables. The pleasant smell of tejpat also enhances the food and makes it even more rich and delicious. Because of its distinctive fragrance, one or two leaves only is more than enough for an entire dish. 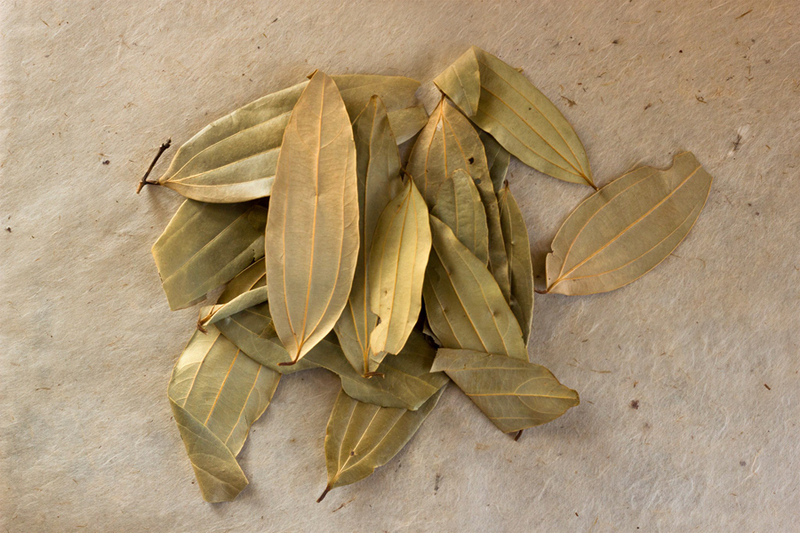 Bay leaf is used as an fragrance in perfumes, essential oil and scented candles, soaps ets. In some part of India, it is used as a substitute for paan [betel leaves]. It is also used as a clarifier in dyeing. - Hario Lasoon, Green garlic plant. - Jimboo, herb belonging to onion family. It is composed of two species of Allium, A. hypsistum and A. przewalskianum. Tastes as between onion and chives.